The Rubbish Diet: Making the most of 2012. Happy New Year! Well Happy New Year all! I hope you enjoyed your New Year's Eve celebrations and are poised to take your empties down to the bottle bank at a decent hour. Personally, I've been looking forward to the start of 2012. Not that 2011 was a crap year. In fact it was rather good to me, aside from the upsets of losing our beloved cat and having to rehome our chickens. Last year was most definitely one of opportunity, whether that meant understanding even more about the opportunities and challenges for Zero Waste, to interviewing Kevin McCloud about upcycling at his Grand Designs exhibition, or making an appearance on Dispatches and Woman's Hour, which both left ripples of amusement as a backdrop to the very serious subject of waste. But there were three significant events that could solidify what 2011 was about for me. The first was the Save the Children conference, which not only gave greater understanding of their amazing work and constant quest for support and funds, but asked us, the attendees, what we were born to do. 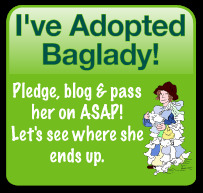 It was then, after many previous thoughts of ditching the blog and my incessant natterings about rubbish, did I make a personal commitment to carry on the challenge to encourage folk to reconsider their rubbish and think about the world outside their bins. There is a great imbalance between the parts of global society that can 'afford' to waste and those which, for reasons of poverty or natural disaster, can't, and this creates a reminder of why as an international community we need to make the most of our resources and use them more wisely, both now and in the future. The second event was my 1000 bins campaign, a 12 week challenge to raise awareness of the often overlooked on-street recycling bin. The aim was to promote Recycling on the Go through the summer of 2011 and draw attention to two significant waste related events, making a connection between Recycle Week, which took place in June and Zero Waste Week, which provided the finale in September. Led by the bespectacled, curly-haired Welsh bundle of gorgeousness, Shedwyn, who was outed as my newly acquired alter-ego, the campaign taught me a number of things: People will actually do things if you ask them to (demonstrated by self-embarrassment when taking photos of bins in public) and that the serious world of recycling and waste could do with a bloody huge injection of comedy that tickles people into rethinking waste. The third event was the energyshare project, where I was sponsored to help raise the profile of the Hexham River Hydro project in its bid to win the funding. This brought me into a community of people who demonstrated not only the appreciation of protecting its foundations but illustrated the power of innovative thinking in moving forward, how making use of a renewable energy source could harness future opportunities for energy creation, generating much-needed income and knowledge sharing to inspire others. 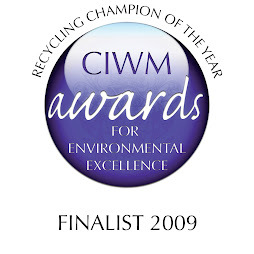 2011 ended with Hexham River Hydro successfully winning their category, which was fabulous news. However for me, the icing on the cake was how not only did I make some new friends, but it unexpectedly brought me back into contact with an old work friend too. A wonderful surprise, which illustrated not only what a small world this is, but how connected we all are, even if we don't actually realise it. So, onto 2012 and looking to the future. Drawing on lessons of 2011, I've decided my theme this year is going to be Making the most of what I've got! Some could say it's enforced. I confess to spending far too much money on clothes and shoes in 2011 and I've been forewarned by my husband that I need to tighten my proverbial belt. However that picture provides an image of doom and gloom. Friends who know me well, know that I'm stubborn in nature and never like being told what to do. However, I refuse to consider 2012 to be a year of austerity, even if it's defined as such. Instead, I'm going to make it into a year of opportunity, and here's a taster. Make more use of my culinary talents, instead of eating out so often (yes, they are still buried deep inside, if I dare to look). Who knows, I may even throw a party, so watch this space for invitations! Make far better use of my clothes, by repairing them myself, or taking them to one of the many alteration shops that are starting to pop up in town. The latter is already sounding a more realistic option. Make better use of my space: do I really need half the stuff that's cluttering up my home? No! Especially as it clutters up my head too. So this is the year I am going to be brutal and set things free. Oh such bravado! Make things last longer, whether it's a glass of wine, an item of clothing or a gadget. Make do with what I've got and borrow what I need. And finally, yes finally, I'm going to make the most of what I've learned over the last few years and work harder to share that knowledge in 2012. I know I've got to overcome my natural shyness first - don't laugh, I really am that shy! I've realised, it's no good keeping my enthusiasm and jolliness about reducing waste to myself. Other people should be entitled to a good giggle too, so that's what I'm going to do this year, get more folk laughing about their rubbish and in doing so, hopefully encourage ambitions to reduce it. In fact, you won't need to wait long. In a few weeks time, I'll be rolling out the 2012 Rubbish Diet Challenge and revealing a handful of bloggers, Tweeters and Facebook friends who have decided to have a go and I can't wait to see them poking about their bins! I hope you'll join in too, or encourage your friends to have a peek. In the meantime, I'll be back over the next few days, chatting about how I'm making the most of my gas consumption as well as my new mobile phone - but not at the same time of course. Tut tut, that would be far too dangerous a combination. So here's to a brand new year ahead of us and ensuring we make the most of it. I do so hope you'll join me. Happy New Year to you. I hope you have a fabulous 2012! P.S. That hat, yes THAT HAT, is not mine, but a frivolous item that can be found amongst the treasures of the Theatre Royal wardrobe department in Bury St Edmunds. Hat hire is available for a small donation only, whereas you can hire a whole costume for just £12. I definitely think I'll be making the most of that this year. As Miranda Hart would say. "Such Fun!" Happy new year to you too! Inspiring post, thanks! very inspiring - now just to get myself into action too! Happy New Year!